I think we probably have a foot of snow at this point. It seems to be tapering off, and doesn’t look like it’s going to change into rain or anything vile like that this late in the evening, so yay. We got plowed once, early in the storm, and I was expecting him to come back again, but he didn’t. I guess (I hope) he’ll make another pass early tomorrow morning. It will sure be nice if we ever get the tractor here. That’s high on the list of stuff still to get done to actually finish the move. The critters all did well and only announced once in the middle of the storm that they were starving. I was sure they couldn’t possibly have cleaned out all the feeders, but sure enough, all were empty, so I topped them all up again. 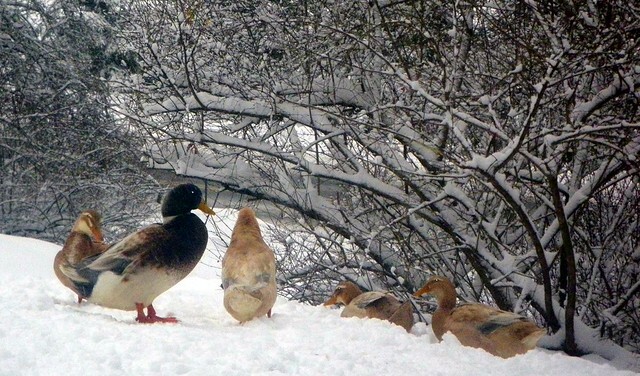 When Frank got home, he was doing well coming up the snowy and steep driveway until the ducks walked right in front of him and he had to stop mid-way up the hill. That didn’t work well. Once I finally got them moved, the car wouldn’t budge, stuck in the deep ruts. Getting that moved was fun. Not! Oh, well. Not a bad first storm at all. We didn’t get much of the wind that was forecast, kept the power the whole time. I’ll take it.